Archbishop Hickey, Monsignor Keating (Appeal Chairman) and Miss Tina D'orsogna, (Chair, Multicultural Gifts Committee) invited Selected Members of the Italian Community for A Special Tour and Afternoon Tea at St Mary's Cathedral. The tour was arranged at the suggestion of Dr Giorgio Taborri, Consul of Italy for WA. His Grace, Monsignor Keating and Tina D'orsogna acknowledged the wonderful support our Appeal has received from Members of Perth's Italian Religious, Sporting and Cultural organisations. The guests were absolutely thrilled with the work undertaken at St Mary's over the past three years and congratulated His Grace on what had been achieved. A special fundraising project was launched by Tina D'orsogna and Dr Taborri on the day. 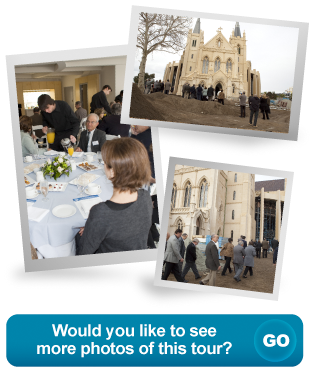 Prominent Western Australian Italian organisations have been asked to join together to help raise a minimum of $150,000 for St Mary's Cathedral. In recognition of this wonderful gesture of support, His Grace announced that the funds would be dedicated specifically for:-the provision of A Statue of a life-sized St Joseph and Mary MacKillop Icon, to grace the new Cathedral. This will be acknowledged and inscribed on the Recognition Memorial which will be constructed in the Southern Piazza of St Mary's Cathedral. The names of every Italian organisation which participates will be included on this Memorial. Tina D'orsogna and Mr Enzo Sirna (President of the Italo-Aust Welfare & Cultural Centre) and Dr Taborri will host group meetings with various Italian Religious, Sporting and Cultural organisations to coordinate this fundraising effort. ... and much more is currently being raised.